Today I tell you "Tsukune". Attention: 1 teaspoon is 5 ml or 1/6 oz. Mix meat, minced onion, egg, minced ginger, 2 teaspoon of soy sauce and salt in a bowl until mashed into gruel. Make the mixture into a round shape. Fry it over easy with oil in a pan. Put Soy sauce, sake and Mirin into the pan before turning off the flame. Turn off the flame and cover the pan with a lid for 30 seconds. This is the basic Tsukune. You can add minced shiitake mushrooms and green onion before mixing with meat. Tsukune is good for deep frying or grilling with sticks too. Sometimes we put Tsukune into vegetable stew (Nimono) or “Nabe”. 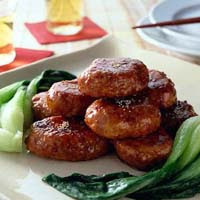 Tsukune is very wide useful and easy to cook. Thank you for posting this recipe. I had lost the recipe a friend had given me so was very glad to see this. It's delicious. My whole family enjoys it. i love how you said you hope everyone understands true japanese culture! I have always loved the real japanese culture. As a child, while my friends were watching anime, i read about zen buddhism, the tokugawa shogunate, and the art of tea ceremony, etc.